Kunyi June Anne McInerney: My Paintings Speak For Me is a sensitive exploration of the experiences of cultural loss, separation from family, and finding fun times amongst hardship. Kunyi June Anne McInerney, Mission Buildings with Dining Area, 2017, acrylic on canvas, 61x91 cm. 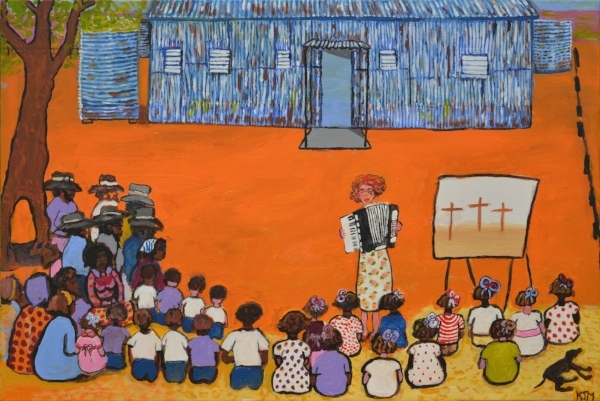 On loan from the Migration Museum, a division of the History Trust of South Australia, image courtesy of the artist. Kunyi June Anne McInerney, Sunday Service, 2016, acrylic on canvas, 61x91 cm. Image courtesy of the artist.